Given the short gameweek, I only have one main topic this week: Man City (and then a couple of words on Harry Kane). 1. It's increasingly difficult to select just three City players given the talent on offer. Silva, Sterling and Mane are all performing incredibly well, especially given their reasonable price tags, while Aguero and Jesus are first and fourth among all forwards in points despite missing time through rotation and injury respectively. Finally, the defense projects as the best in the league in many metrics, making Otamendi and Stones very attractive options for under 6.0m. While the defense has been good - with 5 clean sheets already - this week's couple of sloppy moments against Stoke remind us how fragile clean sheets can be and with City in free scoring mode, I wonder just how committed they will be to keeping opponents out when they're three and four goals up every week. If they had a player who looked to be heavily involved on at attacking front too I would probably stick with him, but Otamendi projects as the best attacking threat with a good-but-not-great profile and so I can't help but conclude that the best way forward is with a couple of midfielders and one of the forwards from this dynamic side. 2. Which of those players I would select brings me to the second point. Without seeing the game one might think City were a touch fortunate, given that they scored 7 goals on 12 SiB and 11 SoT. Both those totals are of course great - and led the league this week - but they'd generally be more suggestive of a 3 or 4 goal haul rather than a 7 goal demolition. Now in part the team probably was a touch "lucky" - Fernandino likely won't hit another shot like that for a while and Bernardo Silva's effort took a bit of fortune to setup - but on the other hand, they really did feel like they would score every time they went forward. Between them, the six goalscorers registered 8 shots on target and scored 7 times. Some regression is coming but we also need to concede that a chance created by that De Bruyne pass is not the same as a Oxlade-Chamberlain cross wildly thrashed into the box. 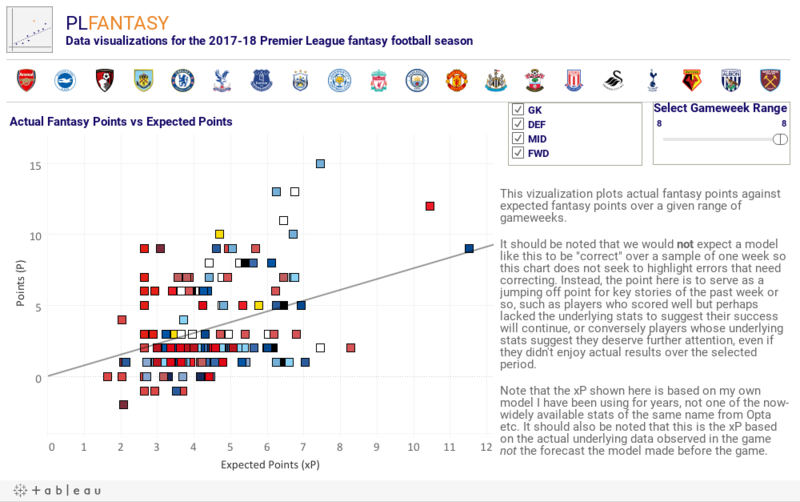 Other expected goal measures account for this for past events (based on positions shot were taken from) but I don't know if we have a good grasp on how to project this going forward other than to mentally note that xG totals for the likes of Aguero and Jesus may well be suppressed in the model due a lack of recognition of the quality of player they are working with. Without having the more detailed Opta data my options are a bit limited but my idea is to work in the G vs xG vs shot data thar's available into my team conversion rates to try and capture this nuance. 7 expected points on a league best 6 shots (3 SiB): he'll be just fine. 86,000 managers aren't as convinced and have sold Kane this week, though that move if defensible if it's a short term play to flip over to Aguero, Jesus or even Morata while Kane endures three tough opponents in the next four games. Indeed, in two of the corresponding fixtures last season - Liverpool (H) and United (A) - Kane didn't notch a single SiB. It's fair to say he's elevated his game somewhat since then though so I wouldn't be too despondent about holding onto the England frontman, especially with that oh-so-juicy sweetener against Palace sandwiched in the middle of those tougher fixures and then a run of games that takes you well past the holidays with only one - Man City (A) really scary game.